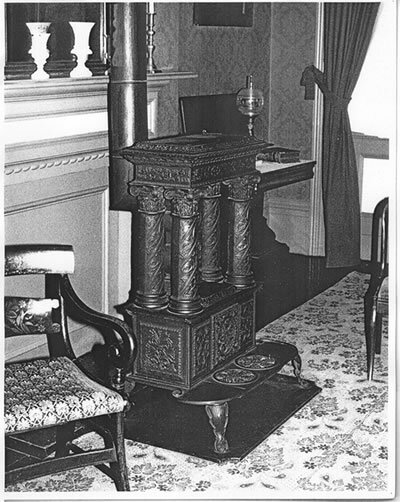 One of the earliest stoves made by McQuesten & Co., a Greek Revival parlour stove, was purchased for William Lyon Mackenzie House in Toronto in March 1962 by Ms. Jeanne Minhinnick and Ms. June Biggar, from Ms. Margaret Brewster for $65.00. Dr. Calvin McQuesten, T.B. McQuesten's grandfather, manufactured the stove in his foundry in Hamilton sometime between 1835 and 1865. Mackenzie House has a letter on file that accompanied the invoice and informed of its safe arrival. It is on letterhead from Brewster Insurance Agency, Hespeler, Ontario. The Stove has been on exhibition at Mackenzie House since 1963. (E-Mail from Richard Gerrard Registrar of Collections, City of Toronto, June 3, 2009). 1 A search on "Brewster" will disclose several letters about the Brewsters, including one in which Margarette McQuesten expresses some concern about their furniture and possessions that have been left at the Brewsters in Hamilton where they were boarding. See (W0993) from his wife Margarette [Lerned] McQuesten Aug 14 1839: "I would just say I am afraid our furniture will be in Mrs. Brewster's way unless you think of returning soon--They have been kind and we ought not take too much liberty--I wish you would write when you shall leave Canada." See also: (W-MCP5-6.371) which is missing except for the Whitehern Calendar note: June [?] 1839) Also from Margarette to her husband DR. CALVIN MCQUESTEN. Whitehern Calendar note states: Margarette McQuesten in Hopkinton NH to her husband Calvin in Hamilton: "Calvin, Marg. & son are staying in Hamilton at home of Mr. & Mrs. Brewster, and she hopes they can stay next winter." This item would seem to suggest that the McQuesten family was already settled in a boarding house in Hamilton in June of 1839, but the letter is missing. McQuesten and Co. made many other stoves and there is one in the White Church on 53 HWy in Ancaster that is very plain about 6 ft long, rectangular and built like a furnace. The pipes circle the ceiling to help warm the building. There is another McQuesten Stove in the Museums Storage facility in Hamilton. It is smaller and not so ornate as the one at William Lyon Mackenzie House in Toronto. In all three stoves, the stove plate states the name of McQuesten. The majority of Hespeler citizens were unfamiliar with the fact and quite surprised to read that the late Thomas B. McQuesten, prominent Hamiltonian and Highways Minister in the Liberal cabinet of Mitchell F. Hepburn, who passed away yesterday, was born in Hespeler. Inquiry on the part of the reporter showed that some of the older residents were familiar with the family name of McQuesten connecting it with the old Upper Mill, but aside from that information did not provide other details. However, after meagre information was gained on the late Mr. McQuesten's residence in Hespeler, Winfield Brewster, always a most informed and reliable source of information on any matter connected with the early history of the town, was contacted. While Mr. Brewster was only a boy himself at the time the McQuesten family were in Hespeler, he was, however able to provide considerable information. In the year 1880, two Hamilton men, John Harvey and Isaac B. McQuesten started a business in Hespeler in the premises which was prior to that time known as the Hespeler Manufacturing Company, and where now the Stamped and Enamel plant is located. The McQuesten family moved to Hespeler and took up residence on Silver Heights in the house later purchased by the late George D. Forbes, which was demolished last year. It was here that Thomas B. McQuesten was born on June 30, 1882. Upon providing that portion of information, Mr Brewster remarked that if his memory served him right that he had heard his father mention a bylaw having passed granting a bonus to the firm of Harvey and McQuesten in opening their business in Hespeler, which bylaw, on file at the town hall would possibly offer further information about the McQuesten family and when and how long they lived here. The bylaw mentioned by Mr. Brewster was made available by Town Clerk W. G. Woods, and scrutiny showed it dated, Dec 30 1880, with the signatures of Lewis Kribs, reeve, and A.J. Brewster, clerk, attached thereto. The bylaw which showed it was carried by the taxpayers, in part reads as follows: "To aid and assist John Harvey and Isaac Baldwin McQuesten, of Hamilton, giving $6,000 to the said parties by way of bonus" The only stipulation in the bylaw was that the firm remain in business for a period of at least 10 years. Isaac McQuesten died in 1888, bankrupt so we do not know if the stipulation was waived. In Mr. Brewster's opinion the McQuesten family lived in Hespeler for quite a number of years and then returned to Hamilton. Thomas B. McQuesten being quite young when the family left town after the firm failed. The plant was then taken over by A. W. Brodie, who came here from Peterborough and later by the Canada Woollen Mills. When the mill closed down the plant remained idle for years until taken over by Stamped and Enamel Limited.